The Bio Bay. It’s the reason we travelled to Vieques and Puerto Rico in the first place, and it turned out to be the highlight of our trip. It was magically incredible; hard to describe in words and almost impossible to photograph in pictures. The scientific answer is that Mosquito Bay, the brightest Bioluminescent Bay in the world, contains millions of single-celled bioluminescent dinoflagellates in every gallon of water. These organisms emit a flash of white light when agitated at night. 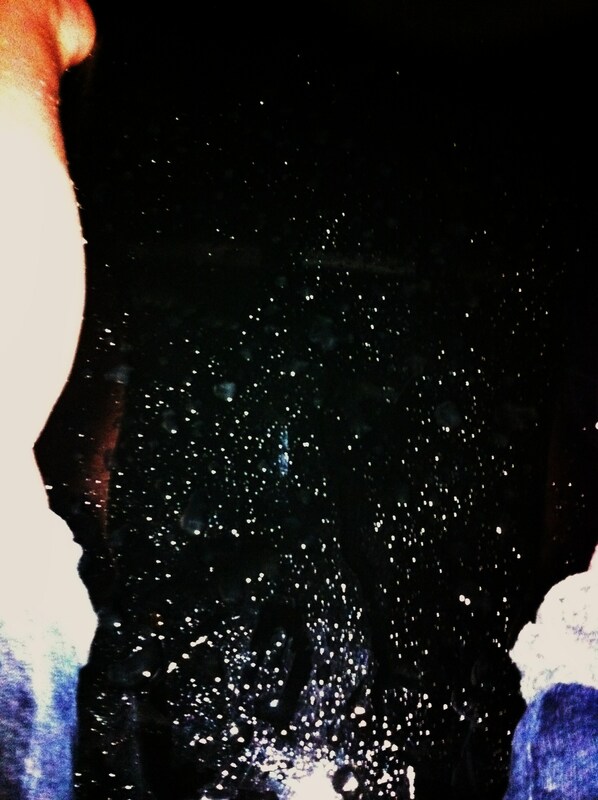 The result is a sea of flashing white diamonds, like a pool full of miniscule lightning bugs. Or as my mother described it, it was like being in a snow globe shaken up with stars twinkling above us and little white organisms twinkling below us as we canoed out to the middle of the bay. Whenever we rowed with our oars, a crest of white moved with us. I was thankful that I’d done my research well and booked us on the clear-bottom canoes, rather than the kayaks or electric pontoon boat. Having a clear bottom let you see all the streaks of light beneath you as you glided across the warm, black waters. Then, in the middle of the bay, our guide tied us all together and talked about the breathtaking constellations above us as well as the wonder of nature beneath us. I played with the water the whole time he spoke. I was not going to let this once-in-a-lifetime experience pass too quickly. The tiny dinoflagellates lit up like sparklers in the water with every move of my hand. It reminded me of the Walt Disney commercials on TV when Mickey Mouse swirls his magic wand and all those mystical lights swirl with it. The water was like that. I put my arms and hands in over and over and swirled the water, lifting a scoopful out of the bay and watching the tiny lights of white rise with me and then dissipate into nothing. We weren’t supposed to bring cameras, but I brought my iphone with me anyway — just in case. They asked us not to use any flash, so it didn’t look like my pictures would turn out. But I did capture one less-than-spectacular shot through the bottom of the canoe. No picture could ever do it justice anyway. I book us on a LOT of tours. So I think that says it all. If we ever go back to Vieques, this is the one thing I’ll do, over and over again, any chance I get. Have you heard of, or been to, a Bio Bay? This is an experience that I think the older you are, the better. Why? Because you will know, through your years traveling through life that you have never experienced anything that will come close to this. You’re right. It’s absolutely incredible to experience a natural wonder like this. I hope it is still there for many generations to come. It seems like a rare privilege. It sounds like an amazing place. It really was. I wasn’t sure if I could express it in words. If you can, do. There are only a few spots in the world where this exists. Mostly in the Caribbean. I think the next brightest is in Jamaica. I googled some pictures to try and get an image in my head but most of what I saw were just people in water surrounded by this hazy halo-like effect. Clearly this can only be experienced in person. I Googled it before I went and saw picture of people surrounded by a green halo-ish aura. But it was nothing like that. I’m not a photographer, so I don’t know how they captured images like that, but what we experienced were tiny white organisms. It does need to be seen in person. Before I Debbie Downer you too much, I thought I’d take a look back at the travel moment that I’m so glad I experienced in 2013, because it’s one that may not make it into the coming years if we don’t do something about it. Seeing the Bio Bay in Puerto Rico. A few months ago, one of Puerto Rico’s bioluminescent bays went dark. It’s not the one we canoed out onto in Vieques Island, but it’s close by. I read the news article and felt an overwhelming sense of sadness and alarm. Being on the water at night, seeing the sparkling dinoflagellates was such a magical experience. It relies on such a fragile ecosystem. But developers in Fajardo cleared out some mangroves and undoubtedly polluted the waters in the bio lagoon. The bay went dark. Scientists still don’t know whether the microorganisms will ever thrive there again or not. See the Bio Bays while you can. I’ve been to this bay and I love it as much as you do! nice job. It’s one of those once-in-a-lifetime experiences that I hope I actually do more than once in my life. That’s amazing. Dinoflagellates – I’m going to have to impress somebody with that word! Believe it or not, when we went and I described what we were going to see, my 7th-grade daughter knew the term! I certainly never learned about it in school. She got extra credit when she went back and told her science teacher about it. Thanks for sharing the magic. Just breathtakingly amazing. Kind of what it feels when we open our Christmas present way back when we were young and believe in the magic of Christmas. Never too late to believe again, right? Happy New Year! That’s exactly how it felt!